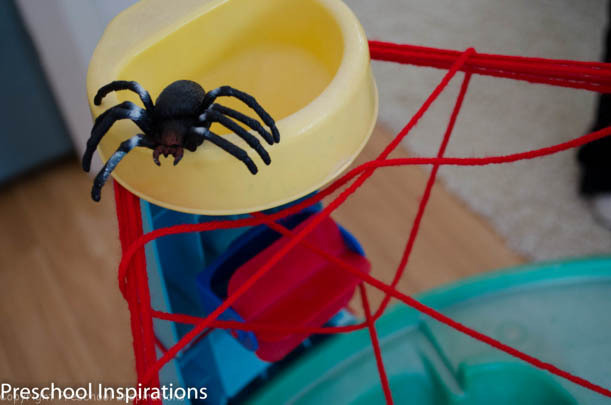 This week is “spider week” at Preschool Inspirations, and we will be featuring a new spider post each day! 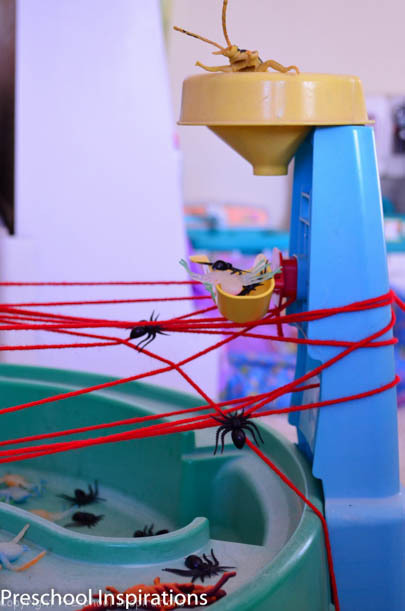 The spiders have overtaken the sensory table at my in home preschool, and it is providing a fantastic learning experience along with tons of fun. I am convinced that anytime the class plays with an activity for a combined total of three hours in the day, it’s a definite win! I used our sand and water table. It is normally our outside water table, but I brought it in for this fall and winter as a sensory table for dry objects. It is a perfect base as there are three posts and lots of holes and crevices to build the web on. 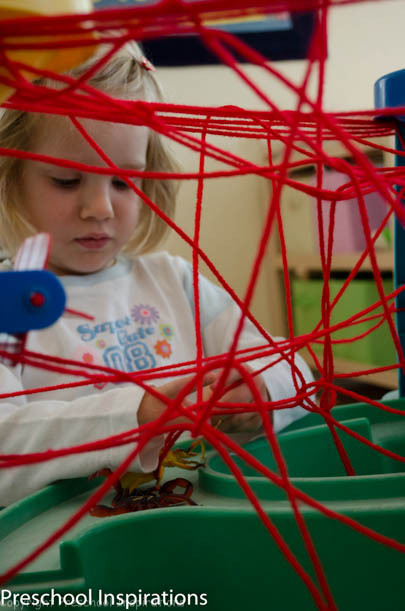 To build our web, I “spun” some yarn around our sensory table, over, and under, and through the open spaces. The more structure it has, the sturdier it will be. I learned this after our first attempt turned into a huge yarn wad after a couple of hours. Some of the older ones helped in the process, which helped build up a ton of excitement. Once our home was complete, it was time to add the inhabitants. At first we put a bunch of bugs in it, and they loved getting them all tangled in the web. Then we added lots of spiders to the mix. We had stretchy ones, glow in the dark ones, and the plain simple ones too. We made sure to talk about how spider webs are sticky and carefully constructed. The students have also been reviewing that spiders have eight eyes and eight legs. It was my plan to keep this in the sensory table for one week, but we will be doing this for at least two weeks since the class has still been so engaged and interested in it. 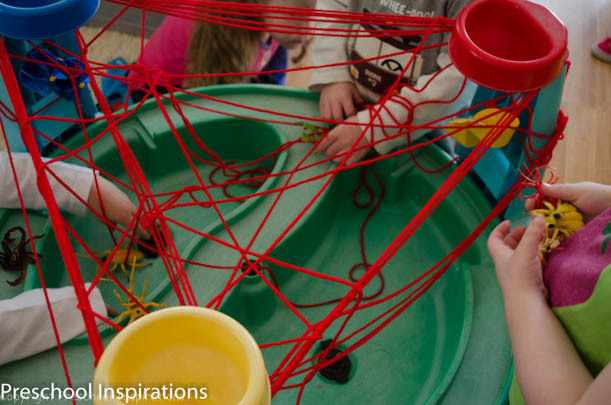 If you do not have a sensory table with posts to wrap yarn around, you could modify this activity by turning an child sized table upside down and using the legs as posts to make your web! What a fun idea! We’ll have to try and set up a version of this before Halloween. Thanks so much for linking up to Discover & Explore. I hope you all love it as much as we do!! Thanks for stopping by, and I look forward to seeing all the other great ideas in Discover & Explore! Now THIS is a fab idea- thanks so much for linking up to Discover & Explore! I’m featuring you this week in my spider roundup! Thanks Stephanie! You totally made my day :). I have had it out for my class for two weeks now, and they still can’t get enough of it. Thanks so much for the feature!! I adore this post – soooooo cute. What a fun way to use the water table!!!! Thanks so much Asia!! This is one of the most fun sensory table activities we’ve ever done. It’s a pleasure to have you as a visitor! That’s so sweet of you to say, Michelle! Simplicity is wonderful, isn’t it! It’s a pleasure to have you visit :).